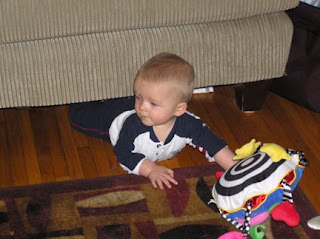 Evan hasn't started crawling yet but he is getting close. He does get on his hands and knees but then belly flops onto the floor. He has discovered that he can move himself but it's backward and not forward. While on his belly, he uses his hands to push back and ends up bumping into a wall or furniture. One time he was almost under his crib! It's too funny! Yesterday we were in the living room and several times he managed to get under the couch. He can only go so far before his head prevents him from going completely under. I had to rescue him each time. I'm surprised the dust bunnies that live under there didn't attack him! Anyway. Here's a picture I quickly took before he could get angry.